Great downhill ride along Loch Loyal but I did walk up the next hill. Gerry doing very well. Couple of sleety showers; some strong headwinds but sunny on the other side. To shelter, but not needed, we had a picnic on the top in the forest. Early for B&B arriving at 1250 before the power cut. Lindsay and Mandy – again great hosts. Walk, sight-seeing in Little Church and to bar (was closed – poss Power Cut) going to try again before supper. Fabulous views of Loch and Ben Kilbreck. WiFi and got a short update on Blog. Excellent supper. Bottle of Red MacGregor at the Altnaharra Hotel ( Car Club from Netherlands there). Walter(at the Bar) and Mandy both say must stop at the Crask Inn. Deer on the hillside above Loch. Wind and rain again off and on. Slog uphill, but I only did a bit of walking to the Crask Inn. Stop at McKay Stone on A836. Not exactly the landlord we expected at the Crask but served the pints of Dark Island and Red Kite with still blood on hands from lambing. Very helpful and friendly people and great soup, cakes and tea. 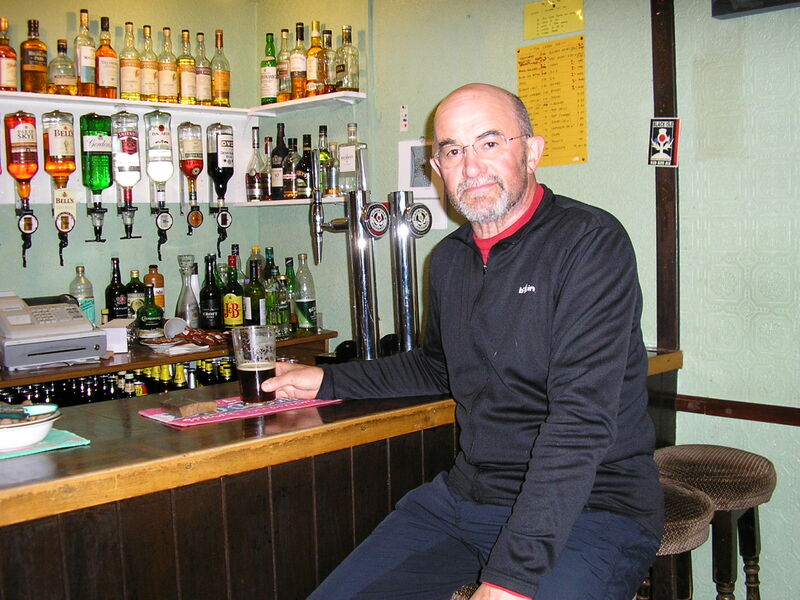 Crask Inn – Beers sampled: Dark Island and Red Kite – Lovely cake too! 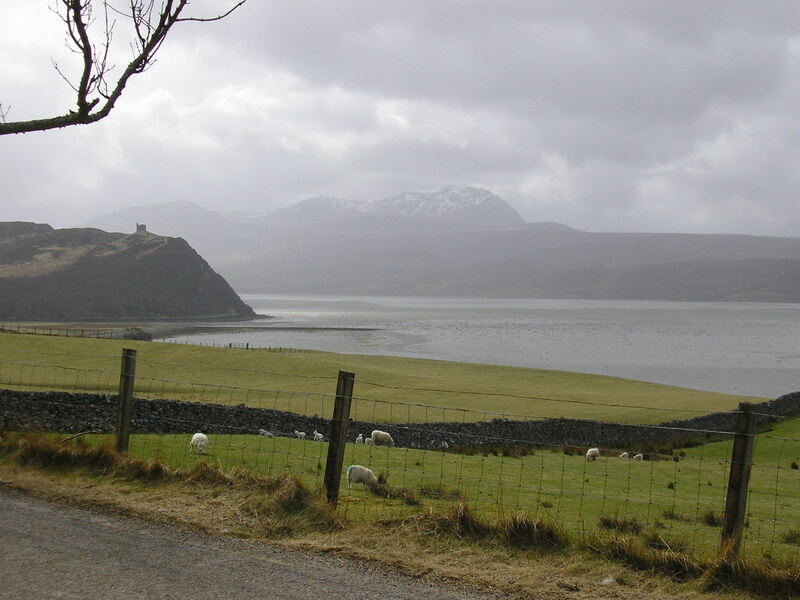 Short climb until virtually downhill to Lairg. Still windy and wet again except some sunny respite. Locals don’t like Wind Farms but one bonus is smooth tarmac roads near the sites. Double track road coming into Lairg a shock – cars travelling a lot faster it seemed. 2 B&Bs full but found the widow Walter from Altnaharra recommended, Wynn, at Saddlers House next to the Post Office. Tea and chats. Chicken in the basket at Crofters Cafe. £250 out of ATM at Bank. Cake for pudding. £53 B&B. Beautiful morning and excellent ride on NCN1 to Tain. Mostly downhill. Tourist bit at Falls of Shin – v.wet and pricey coffee but good cake. No salmon leaping – too early, best late summer. Missed most showers. Snacks in Thatched Shelter at Edderton. Superb Aberdeen Angus bulls at stop after climbing over bridge at Invershin railway crossing (had to unload luggage) – Gerry adjusted my brakes. 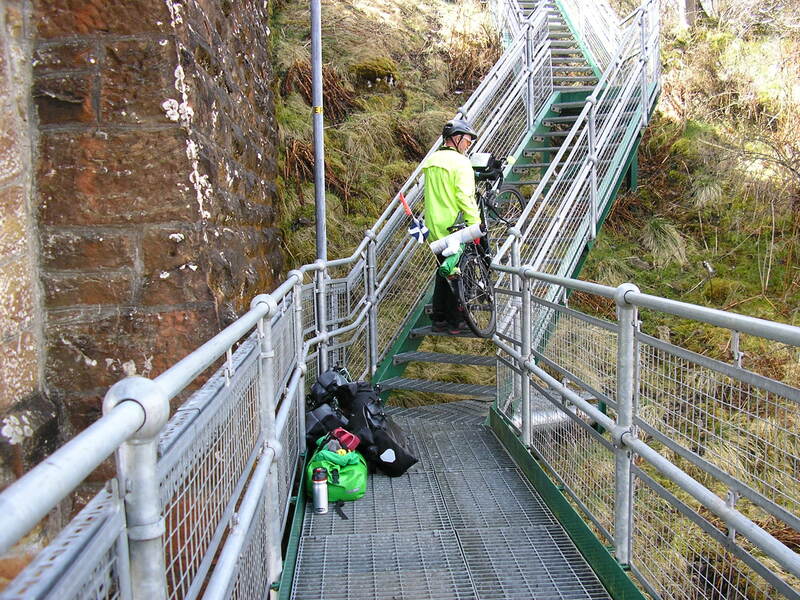 All luggage removed and carry bikes up steps – cycle routes are not all pedalling! Carbisdale Hostel now open. B&Bs showing No Vacancies on road into Tain but found one in Dunbius – OK we think a bit pricey. Walk in town – interesting buildings no luck in Tesco for charging cable for Tablet. Supper very nice – a little pricey but tasty – wedding party in progress. Watched ducks and hens at breakfast. Good ride down to Alness: met recumbent bike (going shopping?) 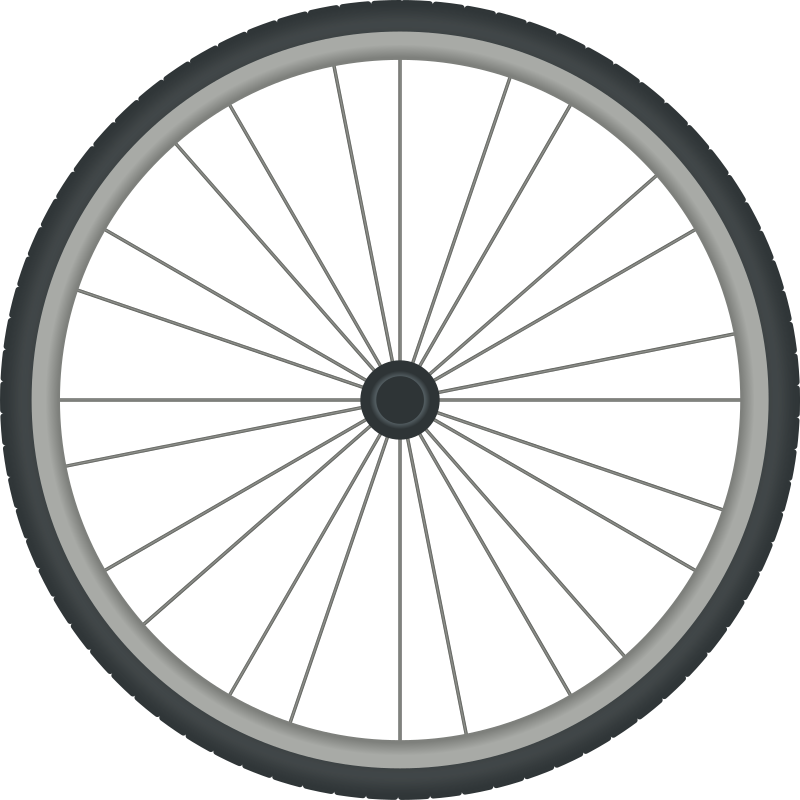 Cycle path through woods – re-did brakes again. 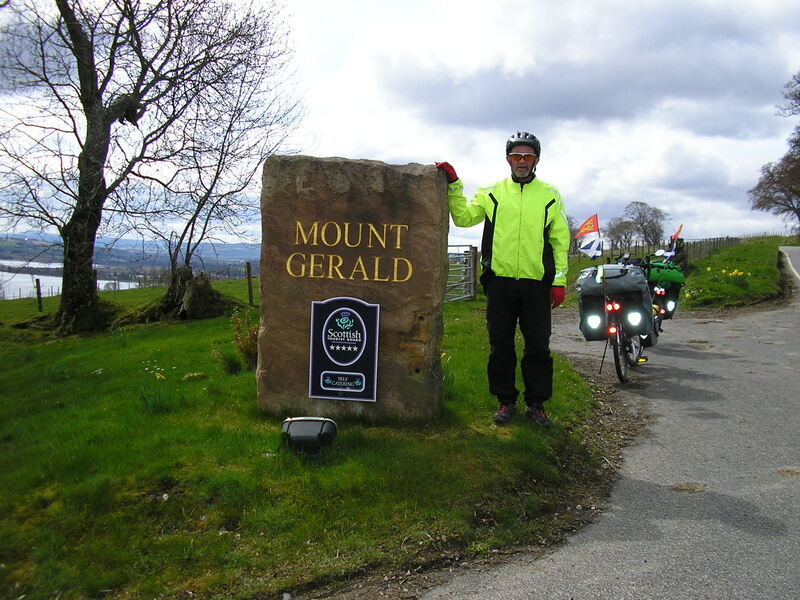 Stopped at Gerald’s Mount. I’m finding going hard again today. Gerry had to take load on uphill route to Tore. Helped a lot but still getting the shoulder pain. Approach to Kessock Bridge a good run but cycle path on “normal” side closed due to road works. Signs diverted but crucial one badly placed so took v. steep hill (walked) up and down again – diversion also steep (offered cup of tea by resident halfway up) Bridge not so bad as anticipated (no wind), bit confused at Inverness end but GPS found the way back to Route. Found hostel (not up to Kristin’s standard) Gerry has upgraded because of my tantrum, so have own facilities. Eaten out for £8 at Morrison’s!! Quite a bit of walking. Wettish on & off. Found charger after long walk to Tesco – got bus back. I’m feeling a bit depressed. Lunch at Pizza Hut. Not terribly inspired by Inverness but felt better when the sun came out! !